Review posted October 29, 2016. Penguin Young Readers, Level 2, 2015. 32 pages. This beginning reader has the pay-off kids learning to read will love. Pig and Fox are friends, but Fox likes to play tricks. In the first two parts, Fox tries to be sneaky and play tricks on Pig and both times, it backfires badly. In the third part, we see that Fox has learned his (painful) lesson. First, this book manages to use rhyme well, a thing that isn't easy. The story is never sacrificed for the rhyme. I also like the way the author has the reader make inferences from the pictures. After the first part, Fox has a Band-Aid and a mark on his tail. After the second part, he's got a cast, a black eye, and two large bandages. Also, when we see a box in the second part, it's been taped back together after its collapse in the first part. 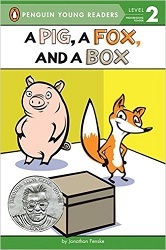 It's also fun the way the reader will see that it's not Pig's fault at all that Fox gets hurt. The whole book is an exercise in seeing things from another perspective. There's also repetition, which is nice for beginning readers. In this case, it adds to the humor when each part starts the same way -- but Fox, who is in bad shape, decides in the third part that he's had enough hiding and playing today.